Place quinoa and 150ml of the water in a saucepan over high heat. Bring to the boil. Reduce heat to low. Cook, covered, stirring occasionally, for 10-12 minutes or until just tender. Drain and refresh under cold running water. Meanwhile, heat the oil in a saucepan over medium heat. Add the onion and garlic. Cook, stirring, for 3 minutes or until soft. Stir in the potato and broccoli stems. Add the stock and remaining water. Bring to the boil over high heat. Reduce heat to medium and simmer for 10 minutes or until potato is almost soft. Add the broccoli florets. Simmer for 6 minutes or until just tender. Add the spinach and mint. Simmer for 1 minute until wilted. Use a stick blender to process until smooth. Stir in lemon juice. Season. Divide soup among bowls. 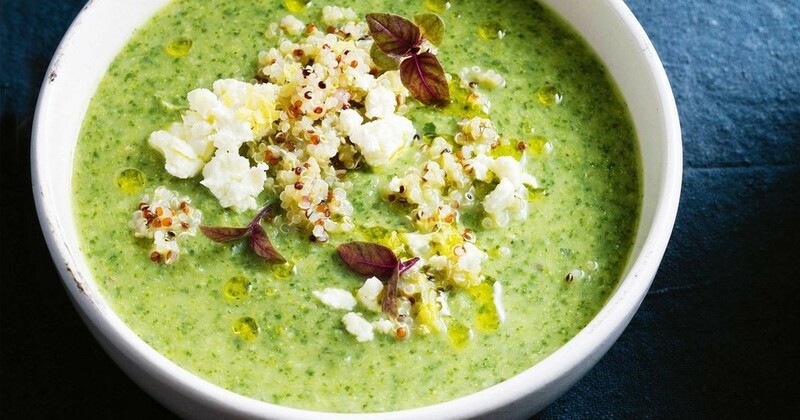 Top with quinoa, lemon rind, feta and baby herbs. Drizzle with extra oil.